JA Obelisk fits right in with the home entertainment, media and movies theme. It is built on the latest version of T3 Framework, supports EasyBlog component and styles for K2 component. 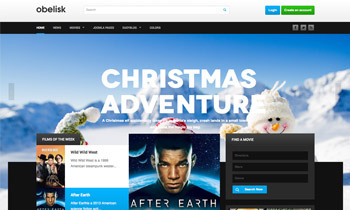 JA Obelisk will spice up your Joomla site with the holiday season spirit. The full width background slideshow located on your masshead will sure bring any detail to the attention. In case anyone feel lost, they now all can count on the search bar up top. You can certainly sort things out in seconds. Comes in 5 colors scheme and 8 bonus pages, JA Obelisk is all you need to get everything set up for this occasion.